In NYC, I'm always stopping by at PRINTED MATTER, INC., which is – according to their website – the world's largest non-profit organization dedicated to the promotion of publications made by Artists. They also organize the NY ART BOOK FAIR. 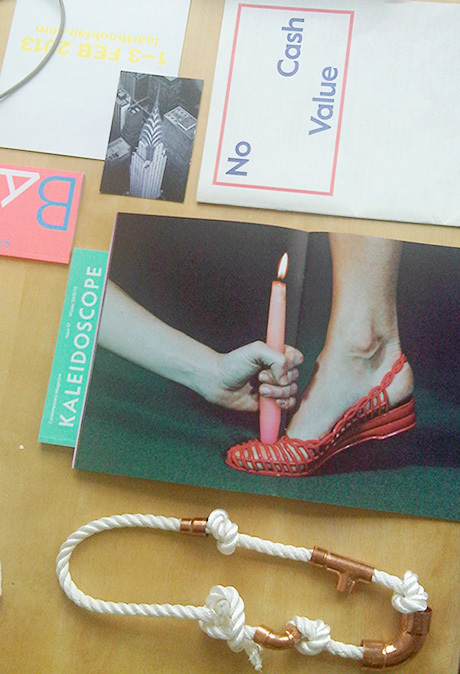 This time I got the magazine TOILET PAPER (which is spread on the photo above), the art magazine KALEIDOSKOPE and a newsprint specimen of COLOPHON FOUNDRY. I stayed over two hours in the store. It's like going to a museum where you actually can buy everything. There's the program of the BARYSHNIKOV ARTS CENTER NYC (the one in fluorescent color) whose building is right next to ours. Last week I was smoking a cigarette downstairs and realized that Mikhail Baryshnikov himself was standing next to me smoking a cigarette too. I just enrolled for ballet class here in NYC and was telling myself to cut down cigarette consumption but when the greatest ballet dancer ever is smoking a cigarette right beside you, your intentions are suddenly gone. I'm doing well at ballet class by the way. I always get attention when wearing this self-made necklace (above) inspired by plumbers and sailors. HENRI J. SILLAM, our Haute Joaillerie client, would wrinkle his nose in complete disgust. But I have to say that Building Supplies Stores are a very sophisticated inspiration source. I really can recommend going there!